macOS crash that might happen when some hints were displayed. No name nor favicon on dragged tab view. [Windows] Toolbar dialogs placed a little lower. 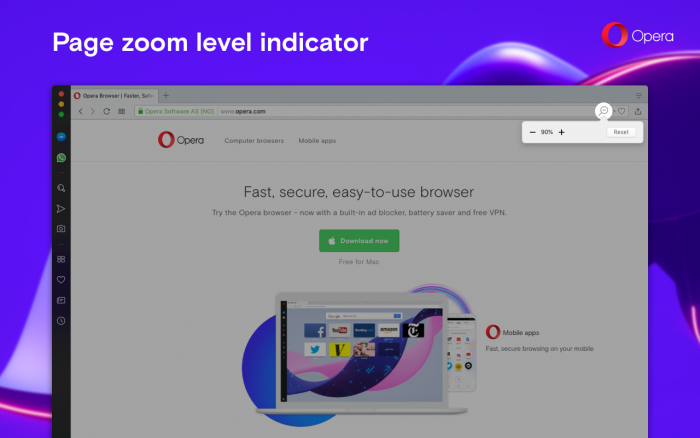 Today we prepared an Opera 57 developer update for you. Because many of you suggested to make new Settings page more compact, we have decreased space between the sections. Please let us know if you like it. Also, we added a page zoom level indicator in the combined address and search bar. If you change the level of page zoom, you will see a pop-up informing you about it. You can then change the page’s zoom level by using +/- in the pop-up. If you have page zoom set to default for all pages, the zoom indicator won’t appear in the address bar until you change the zoom on one of the pages. You can adjust the page zoom level for all web pages by going to Settings > Basic> Appearance > Page zoom. If you have adjusted the zoom level for an individual website, go to Settings > Advanced > Privacy and security > Content settings > Zoom levels. Moreover, we added some improvements to the new enhanced address bar, a feature where you can access your Speed Dial from the address bar while browsing. Check out the available tools for the enhanced address bar by going to Settings > Appearance > Manage Quick Access. Chromium was updated to version 70.0.3521.2. DNA-71517 No blink symbols in crashlogs for most configurations.